Baty International has supplied its Venture Plus vision system to improve measuring accuracy and repeatability during quality inspections at Danielson's Aylesbury manufacturing plant. Danielson offers customer-specific solutions and can work closely with clients from the design stage, through to the production and delivery of a wide range of man machine interfaces (MMI) and industrial graphics (IG) solutions. Custom membrane switches, piezo switches and touch screens are a critical interface between the user and a multitude of devices, machines and technical equipment. Man machine interfaces often define the operator's user experience, consequently they are crucial to the perceived value of the products they are part of. As Danielson's products are frequently subject to continuous harsh use and are the most exposed part of a host device, product quality is of paramount importance. As an ISO 9001:2008 and ISO 14001:2004 certified business, Danielson's products are tested in accordance to multiple aeronautical and military standards. The company can also operate in other challenging markets such as medical and laboratory. In order to maintain its reputation, Danielson makes regular investments in inspection equipment. The company recently found itself in need of an accurate, non-contact, automated dimensional measuring machine that was able to measure in the micron scale. After looking at other manufacturers offerings, Doug Sellers, the quality manager of Danielson's Aylesbury manufacturing plant, contacted metrology company Baty International. 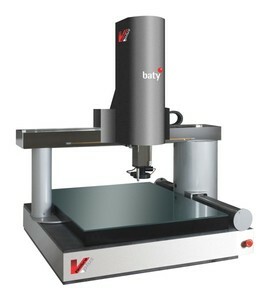 Baty manufacturers two-dimensional optical profile projectors and full three-dimensional camera-based co-ordinate measuring systems. 'We subsequently installed the Baty International Venture Plus machine in our environmentally controlled inspection department,' said Sellers. 'Our new vision measuring system has given us the levels of measuring accuracy and repeatability required across our full range of products. 'We have also purchased an identical machine for use in our manufacturing plant based in the Netherlands,' he added. Baty International's Venture Plus range includes systems that cover two standard measuring ranges, with X, Y, Z, capacities of 640mm x 640mm x 250mm and 640mm x 940mm x 250mm. Based on a robust mechanical design, the cost-effective Venture Vision system has a host of features, including an integrated mount, suitable for the fitting of a standard Renishaw TP20 touch probe and Baty's fully programmable white LED surface lighting system. An automatic video edge detection facility with circle, arc, line, point tools and free-form scanning tool enables the capture of thousands of data points in seconds. The Venture uses a high-resolution USB2 CCD camera that provides a high-definition colour image, a digital zoom and sharp image capture capability for professional reporting. A premium 6.5:1 CNC zoom lens allows the automatic selection of the optimum magnification for each featured part, while Z-axis measurement is performed in auto-focus mode. The Venture's software provides a best-fit comparison to DXF files, giving an instantaneous pass/fail for complex shapes. A bi-product of a Venture measuring routine is that a fully dimensioned drawing of the measured part is produced automatically. SPC analysis, including graphic control charts, is also included within the Venture's software package.